Stoneman's Raid included 6,000 veteran horsemen and occurred during March and April of 1865-- the final months of the Civil War (1861-1865). The entire raid was Maj. Gen. George Stoneman's brainchild: but he had been deemed a miserable failure in battle; had orders relieving him of military service; had been bemoaned by Secretary of War Stanton and Lt. Gen. Ulysses S. Grant; had the dubious title of having been the highest ranking Union prisoner-of-war; and his name was synonymous with the latest jokes among Washington's elite. But Stoneman's friendship with Maj. Gen. John Schofield, who outranked the fellow major general by date of rank and command position, allowed the scorned cavalry commander another opportunity in an otherwise concluded Civil War. Within weeks Lee would surrender to Grant, so Stoneman's hopes of one final hurrah before the closing act had to occur now. Without the raid, the New Yorker would have most likely been a short narrative in Civil War history. While the tall, rough looking Union officer never sought glory nor accolades from anyone, he only wanted to fight for the United States. Because of the following history, George Stoneman is still frowned by many, while hailed forever by others as one of the Union's elite cavalrymen. In late March 1865, Union General George Stoneman (future governor of California) led nearly 6,000 cavalrymen from Tennessee into western North Carolina and southwestern Virginia to disrupt the Confederate supply line by destroying sections of the Virginia & Tennessee Railroad, the North Carolina Railroad, and the Piedmont Railroad. He also sought to liberate Union prisoners-of-war held in Salisbury and hoped to deprive the Confederate armies of supplies, cut off avenues of retreat, and encourage Unionists in western and central North Carolina. On the thirteenth of April, General Sherman entered Raleigh. The day before, General Stoneman had occupied Salisbury. The Reconstruction Era soon followed. As the war neared an end, Union cavalry commander Major General George Stoneman mounted a raid from Tennessee across the Blue Ridge Mountains into western North Carolina. 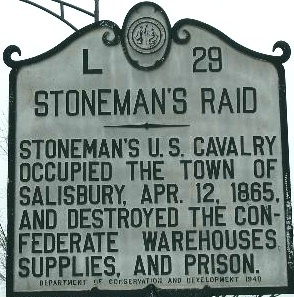 Initially, Confederate officials believed the prison at Salisbury was the sole objective. Stoneman's forces, however, moved back and forth across the North Carolina and Virginia borders and targeted railroads, industries, and warehouses for destruction. On March 24, 1865, Union cavalry under Major General George Stoneman, commander of the Union army “District of East Tennessee,” marched throughout western North Carolina during one of the longest cavalry raids in history. (Right) Maj. Gen. George Stoneman. Ca. 1863. George Stoneman, Jr. (1822 – 1894) was a Union cavalry general in the Civil War and later served as 15th Governor of California. Nearly 6,000 men under Stoneman’s command entered North Carolina with a mission to destroy and not to fight large pitched battles in order to expedite the close of the Civil War. Stoneman’s Raid, which was approved by Gen. Grant himself, coincided with the raids and battles of General William T. Sherman in the eastern sections of the state, as he was concluding his Campaign of the Carolinas, which was stretching Confederate local home guards and militia units thinly across the state and forcing Rebel commanders to make hard choices on where their men were needed most. Stoneman divided his men and sent detachments throughout the region, securing the destruction of the region’s factories, bridges, railroad lines, depots, and even the infrastructure (North Carolina American Civil War Railroads). The army relied heavily on local citizens for food and supplies, often emptying storehouses and local homes. 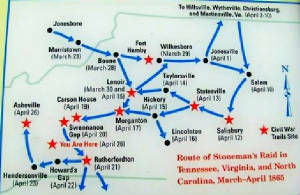 Stoneman’s raids in North Carolina lasted from late March until May when his command assisted in the search for Confederate President Jefferson Davis as he fled the collapsed Confederacy. 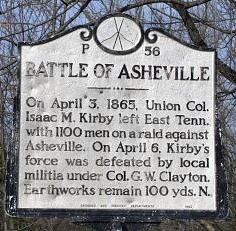 The men had marched more than 1,000 miles during the raid and historians credit their march with assuring the death of the Confederacy as they captured artillery pieces and took thousands of prisoners while destroying Confederate army supplies and blocking a line of possible retreat for both Lee and Johnston’s armies. Stoneman attended West Point (class of 1846) and his roommate was future Confederate General "Stonewall" Jackson. "On the 10th [of April] we moved south, arriving at Germantown . . . . The number of negroes who were following the column had increased to such an extent as to endanger the safety of the command . . . . Several hundred were sent from this point to East Tennessee . . . and most of those fit for military service, I have since learned, are now in Colonel Bartlett's [119th] U.S. Colored Troops . . . . [At Salisbury] The fruits of this victory were 18 pieces of artillery with caissons, forges, and battery wagons complete, 17 stand of colors, and between 1,200 and 1,300 prisoners and the possession of the town, with its immense depots and arsenals, and the Salisbury Prison . . . . at 2 p.m. on the 13th, Major [George F.] Barnes reported the destruction of all rebel supplies [at Salisbury] to be complete. From the preceding afternoon up to this time, the air had been constantly rent by the reports of exploding shells and burning magazines. For miles around the locality of the city was marked during the day by a column of dense smoke, and at night by the glare of burning stores." — Brig. Gen. Alvan C. Gillem, commanding Cavalry Division, District of East Tennessee, reporting on Stoneman's Raid in Western North Carolina, April 25, 1865. 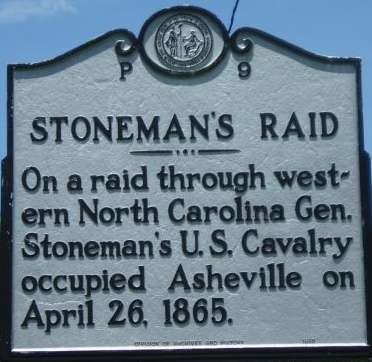 After hearing rumors of the end of the war, Stoneman’s men remaining in North Carolina under the command of General A. C. Gillem marched toward Asheville. 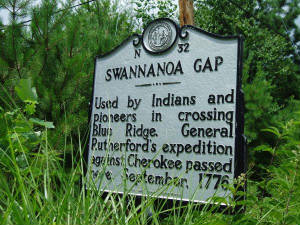 The Union forces reached the Swannanoa Gap on April 20th after a successful raid on Morganton. At the gap, they were met and repulsed by Thomas' Confederate Legion of Cherokee Indians and Highlanders, a battle-hardened force of 500 Confederates with 4 pieces of artillery, which had constructed a formidable blockade (see Civil War and Guerrilla Warfare). Gillem, aware that the Confederates were in a strong defensive position and that his force could not break that position, ordered his men to deceive the Confederates as some men maintained the guise of a frontal assault while others, the main body, flanked the Confederate position. Because of the mountainous environment, the flanking movement was a wide march that took Gillem and his men into Rutherfordton, forty miles south of the Swannanoa Gap, on April 21. The flanking movement effectively placed Gillem and his men in the heart of the Confederate backcountry. 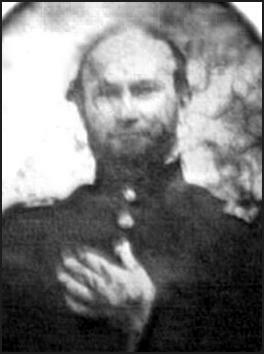 Regarding the Swannanoa Gap engagement, Confederate General James Green Martin, who had lost an arm during the Mexican-American War (1846-48) and now commanded the Western District of North Carolina, had ordered Lt. Col. Love, commanding infantry regiment, Thomas' Legion, to move his regiment and hold the Swannanoa Gap against the enemy that had advanced quickly from Salisbury. In preparation for the Union assault, Love had ordered the regiment to cut down many trees as a defense. Known as an abatis it made a good defense but a better ambush. Love's Regiment, which had recently lost a staggering 80% of its force while serving under Gen. Jubal Early during the Shenandoah Valley Campaigns (Shenandoah Valley Campaigns of 1864-1865: The Battles), had returned to the western North Carolina mountains in December 1864 by special orders. Prior to vacating the Shenandoah, Gen. Gabriel Wharton commended and acknowledged the regiment for its conduct under fire and for never retreating during battle. The veteran regiment now found itself in good ground at the gap and it soon encountered General Gillem's under-strengthened cavalry division. 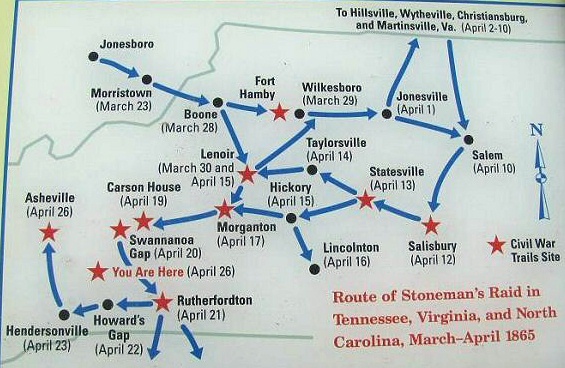 Early in the afternoon, April 23rd, Stoneman’s cavalry division left Hendersonville, North Carolina, to cover the remaining distance to Asheville, N.C. After three hours of riding, the Union troops halted their horses as a few Confederates presented Gillem a flag of truce. General Martin, commanding Western District of North Carolina, had sent word from his headquarters in Asheville that he had received official notification of the truce. As a result, a meeting between Gillem and Martin was arranged for the morning of April 24th to discuss surrender terms. The Civil War Battle of Brandy Station involved approximately 17,000 cavalry and was the largest clash of horsemen on the North American continent. Stoneman and his cavalry division thus passed out of the war and into local legend. The raid had been a powerful one. A force of only 6,000 men had destroyed uncountable tons of supplies and miles of railroad tracks, shocked the local citizens with the reality of war, traveled more than 600 miles through enemy territory, and assisted in the capture of Jefferson Davis. Stoneman, one historian appraised, had utilized the methods of Sherman in a ’splendidly conceived, ably executed attack upon the war potential and the civilian population of the South.’ Sherman himself, the author of the concept of total war, admiringly referred to Stoneman’s raid as ‘fatal to the hostile armies of Lee and Johnston.’ Stoneman and his men, beyond any doubt, had amply fulfilled their orders ‘to destroy.’ See also Civil War Cavalry Weapons, Battles, Uniforms, Role, Tactics, and Organization. (Left) Tintype photograph of General James Green Martin. Regarding the preparing, organizing, and mobilizing of North Carolina for the Civil War: "The man [James Green Martin] thus trusted was a one-armed veteran of the Mexican war, a rigid disciplinarian, thoroughly trained in office work, and not only systematic but original in his plans. The State has never fully appreciated, perhaps never known, the importance of the work done for it by this undemonstrative, thoroughly efficient officer." Words of Daniel Harvey Hill, Jr., author of Confederate Military History Of North Carolina: North Carolina In The Civil War, 1861-1865. D. H. Hill, Jr. was the son of Lt. Gen. D. H. Hill, who was brother-in-law to Gen. Stonewall Jackson. Lt. Gen. Hill was also one of only two lieutenant generals from North Carolina. (Right) Photo of Brig. 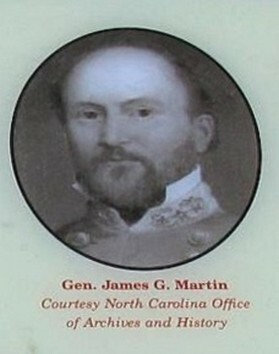 Gen. James Martin courtesy North Carolina Office of Archives and History. Notes: George Stoneman, Jr. (August 22, 1822 – September 5, 1894) was a career United States Army officer, Union cavalry general during the American Civil War, and Governor of California (1883 and 1887). Stoneman attended West Point (class of 1846) and his roommate was (future) Confederate General "Stonewall" Jackson. (See Union Generals from West Point and Confederate Generals from West Point.) Oddly, both Stoneman's Raid of 1865 and General James Green Martin have gone practically unnoticed in American history. Despite its geographic scope, Stoneman's 1865 raid failed in its primary goal of helping to end the war. Instead, the destruction the raiders left behind slowed postwar recovery in the areas it touched. In their wake, the raiders left a legacy that resonates to this day, even in modern popular music such as The Band's ''The Night They Drove Old Dixie Down.'' Based on exhaustive research in 34 repositories in 12 states and from more than 200 books and newspapers, Hartley's book tells the complete story of Stoneman's 1865 raid for the first time. From the Author: George Stoneman's 1865 Union cavalry raid did much for his tattered reputation, perhaps even helping the major general to the governorship of California in 1883. But many take a darker view of Stoneman's Raid. When the first North Carolina historical markers commemorating the raid were installed over seventy years afterward, citizens tore them down and threw them in a river. Stoneman's Raid has always been like that. Some see it as a model action in which a mostly well-behaved force rode over a thousand miles and achieved important military objectives. Others say it was a brutal, unnecessary pillaging of a broad swath of six Confederate states after the Civil War was already decided. Regardless, no other such action has inspired both a classic song - The Band's "The Night They Drove Old Dixie Down" - and a Disney TV movie. After leading a failed raid in the Chancellorsville campaign and later earning the dubious honor of being the highest-ranking Union prisoner of war, Stoneman was described as "one of the most worthless officers in the service" by Edwin Stanton. The 1865 raid was his last chance at redemption. Beginning in Knoxville in March 1865, Stoneman led about four thousand cavalrymen over the mountains and into North Carolina and Virginia. The raiders tore up tracks, burned bridges, destroyed Confederate stores, captured towns like Christiansburg and Salisbury, fought some surprisingly sharp skirmishes, and terrified the population, achieving a sometimes exaggerated reputation. Their mission did not end until Confederate president Jefferson Davis was captured. Reconstruction would be harder in their wake. Chris J. Hartley's Stoneman's Raid, 1865 is the most detailed and complete account ever written of an action that remains as controversial today as it was in its time. About the Author: Chris J. Hartley has worked in marketing and communications for several large companies. On the side, he chases the history that has fascinated him since childhood. He has published several articles and is a frequent speaker about the Civil War. He lives in Pfafftown, N.C. To complement this exhaustive study, also consider purchasing Stoneman's 1865 Raid (DVD). The main body of the work focuses on his Civil War service, during which he directed the progress of the Union cavalry and led several pivotal raids on Confederate forces. In spite of Stoneman's postwar career as military governor of Virginia and governor ofCalifornia, his life was marked by his inability to reach ultimate success in war or politics, necessitating a discussion of his weaknesses as a commander and a politician. Period photographs are included. About the Author: Ben Fuller Fordney teaches American history at Blue Ridge Community College in Harrisonburg, Virginia. He serves as director of the Shenandoah Civil War Associates. To complement this one-of-a-kind examination of one the most daring cavalry raids of the Civil War, consider purchasing Chris J. Hartley's Stoneman's Raid, 1865, an exhaustive and complete study of Gen. George Stoneman's 1865 Cavalry Raid. Covers raids from J. E. B. Stuart's 1862 ride around McClellan's army to James Wilson's crushing raids in Alabama and Georgia in 1865. About the Author: Robert W. Black, a retired U.S. Army colonel who served as a Ranger in Korea and Vietnam, is author of several books. They seemed to move behind enemy lines almost at will, and in what is perhaps their most celebrated exploit, a handful of them led by Mosby himself rode into Fairfax Station, Virginia, in the dead of the night and kidnapped a Union general. When they were not on missions, Mosby's riders simply melted into the countryside, finding safe haven in the homes of sympathetic civilians. Theirs was a guerilla war. The frustrated North eventually assigned a special contingent of cavalry to combat them, and a price was ultimately put on Mosby's head. Nobody reined him in, however, and his command enjoyed the proud distinction of never having formally surrendered to the bluecoats. Shortly after Appomattox, Mosby simply disbanded his unit. This is another fine book from the prolific Civil War historian Jeffry D. Wert, who hardly could have picked a more intriguing subject. But Stuart was mortally wounded at Yellow Tavern in May 1864. Not since the death of Stonewall Jackson had the South sustained so great a personal loss; his rollicking, infectious gaiety and hard fighting were sorely missed in the grim last days of Lee’s army. By all accounts, I Rode with Jeb Stuart is the most reliable and persuasive portrait of Stuart offered by a contemporary, and it is indispensable for any thorough knowledge of the great Confederate cavalryman. 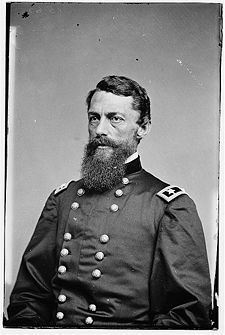 About the Author: Major Henry Brainerd McClellan (1840-1904) was adjutant general to Stuart and wrote of "the signal gallantry displayed by him in the field and his efficiency and zealous devotion to duty as a staff officer." Now, HISTORY reveals the lesser known aspects of the civil war in 9 compelling documentaries: Tales of the Gun: Guns of the Civil War, The Lost Battle of the Civil War, The Most Daring Mission of the Civil War, April 1865, Battlefield Detectives: The Civil War: Antietam, Battlefield Detectives: The Civil War: Gettysburg, Battlefield Detectives: The Civil War: Shiloh, Secret Missions of the Civil War, and Eighty Acres of Hell. Also, with nearly 10 hours of Civil War history, this is welcome addition to school and local libraries, as well as the Civil War buff.